Both the EU and Japan benefit by the sharing and pooling of academic knowledge, expertise, ideas and exchange of students. The EU Delegation in Tokyo supports this flow of knowledge, as well as helping Japanese students to learn about studying in Europe, by offering access to and information on EU programmes. European and Japanese universities have been collaborating for some time under established programmes such as Erasmus Mundus whilst the new EU programme for education, Erasmus+ provides new and exciting opportunities to Japanese and EU universities and students to work together. The EU Institutes in Japan, based at prestigious Japanese universities, promote academic exchange and EU studies in both Tokyo and the regions. 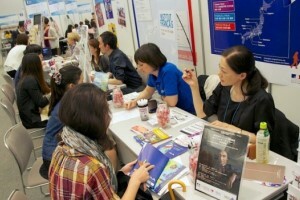 Europe is an ideal study abroad location for Japanese students, and the annual European Higher Education Fair provides students with information on many different options Europe has to offer. Erasmus+ is the EU's flagship education initiative that offers opportunities to Japanese higher education institutions to engage with European counterparts as part of higher education mobility and cooperation projects. A Call for Proposals has now been launched with deadlines in February 2017. Non-European students can benefit from study abroad programmes of 3-12 months under International Credit Mobility agreements between European and non-European universities. Students can earn credits at their host university, which will be recognised by their home university, without paying any extra fees. The 2016 call for proposals saw the selection of over 60 partnerships between European and Japanese institutions. 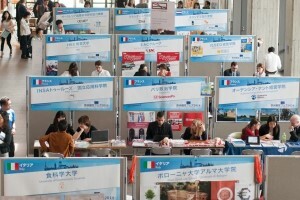 Under Erasmus+, Japanese universities can become full or associate partners with European universities in Erasmus Mundus Joint Master Degrees　(double degree programmes are also possible), similar to the way in which several universities already offer joint programmes, established under Erasmus Mundus, the forerunner to Erasmus +. Japanese students can also apply as individuals to take part in joint master programmes and study in Europe in at least 2 different countries. The EU supports excellence in teaching and research on the European Union worldwide through the Jean Monnet initiative. Japanese universities may apply for funding to set up individual courses on the EU (Jean Monnet Modules), or to establish focused EU research and teaching centres (Jean Monnet Centres of Excellence). Individual scholars can also apply for funding to support their teaching and research on the EU (Jean Monnet Chair ). There is also an active Jean Monnet Centre for EU Studies at Keio University. It should be noted that applications International Credit Mobility and Erasmus Mundus Joint Master Degree projects must be submitted by the European partner institution involved. European and Japanese universities have a history of working together, benefitting from EU programmes such as Erasmus Mundus and EU-Japan co-funded student exchange and double degree projects. Universities such as the University of Tokyo, Okayama University, the Tokyo Institute of Technology, Osaka University, Hosei University, Waseda University, Kyushu University, Keio University, and Kobe University have successfully collaborated with European Universities to create new Joint Master, Joint Doctorate, and Double Degree projects. Such courses and programmes focus on a range of subject areas from cultural and social developments in Europe, European Studies, and European philosophy, to sustainable energy development, engineering, and neuroscience. The EU Institute in Japan initiative, running successfully since 2004 promotes academic cooperation between Japan and Europe in European political science, law, economics, environment and medicine. They have established EU-related courses, with scholarships available to undergraduate and postgraduate students. Visiting professors from Europe give special lectures and Japanese and European universities undertake joint research and academic exchange. Founded in 1980, the purpose of the European Union Studies Association-Japan is to promote studies on the EU through close co-operation with similar academic associations around the world. It has around 500 members, mostly academics, but also including journalists, businessmen, government officials, and lawyers. The Association organises an annual conference at a different host university each year. Europe is a global leader in study programmes for learners of all ages and is a popular destination for students from around the world. The EU Delegation in Tokyo helps to promote Study in Europe, working with EU Member States to organise the annual European Higher Education Fair (EHEF) in Tokyo and Kansai. The Study in Europe page provides further information on the EHEF and other useful information specifically for students.